For the past 25 years, Bruce R. Rothschild, DDS has provided gentle and compassionate family dentistry in Pearl River NY. Discover for yourself why so many people make him their choice for their family dentist in Pearl River NY. Many times people simply ignore the early signs of tooth decay, gum disease, and other oral health problems. By contacting a local family dentist in Pearl River, NY like Dr. Rothschild, you’ll not only prevent the pain associated with severe tooth decay and gum disease, but you’ll also decrease your risk of tooth loss. Additionally, treating dental problems early is less expensive than waiting until you need major dental interventions. Why do people have bad breath that never seems to go away? What can be done about it? Answer: Bad breath, also called halitosis, in most cases is a sign of poor oral hygiene. If you do not brush and floss regularly or do not do a thorough job, food particles and bacteria start to accumulate. In addition to causing an unpleasant odor, this debris also causes tooth decay and gum disease. If you or a family member has chronic bad breath, you need to contact Dr. Rothschild for a dental exam and cleaning. Other causes of bad breath include sinus and upper respiratory infections or problems with your digestive system. Question: What causes tooth sensitivity? Answer: Sensitive teeth are often the first sign of tooth decay or gum disease. Other reasons for tooth sensitivity include tooth cracks or chipping as well as thin tooth enamel caused by grinding. Since only a dental professional can determine the exact cause of your sensitive teeth, you need to schedule an appointment with Bruce L Rothschild, DDS & Associates, P.L.L.C. for an exam and to determine the best treatment to relieve your discomfort. 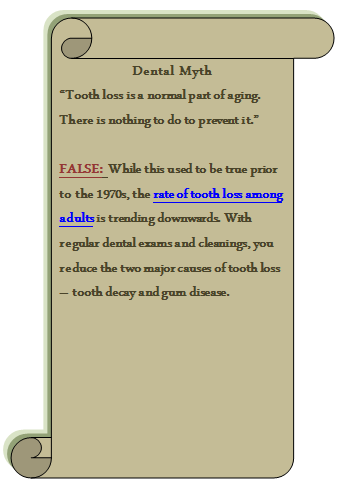 Question: What causes tooth decay? Answer: Tooth decay is the result of tiny bacteria eating away at the enamel of your teeth. Some people are more prone to developing cavities than others are because the enamel of their teeth is thin or weak. In these cases, Dr. Rothschild can apply dental sealants, recommend dental rinses, or provide a mouth guard to protect and strengthen your tooth enamel. These interventions reduce your risk of developing tooth decay. Question: Why do people grind their teeth? Answer: Tooth grinding may be a sign of stress or anxiety or an issue with your bite. In either case, Dr. Rothschild can make a custom mouth guard to protect your teeth from damage. Question: My gums bleed when I brush. Is this serious? Answer: Bleeding or tender gums are the first signs of gum disease. After an exam to determine the extent of gingivitis or periodontal disease, Dr. Rothschild can recommend a treatment to restore the health of your gums to reduce your risk of tooth loss. For more answers to your questions about family and cosmetic dentistry in Pearl River, NY, contact Dr. Bruce L Rothschild & Associates, P.L.L.C. at 845-623-0305.